Roy Roswell Poulton was born on September 8, 1893 at Toronto Canada. The son of Mr. and Mrs. Joseph Poulton of 51 Yonge St. Toronto. He attended Jarvis Colligate, and was a member of the Metropolitan Church and Sunday school. Before enlisting he was employed as at the Gurney Foundry Co. as timekeeper. The 3rd Battalion sailed for England with the 1st Canadian Contingent on October 3, 1914 under the command of Lieut. Col. R. Rennie with 43 officers and 1101 other ranks including brothers Roy and Melvin. The 3rd Battalion arrived in France in early February 1915, taking over trenches in the Ypres Salient. They were a part of the 1st Brigade 1st Canadian Division. While engaged in the first poison gas attack at Ypres (April 22-25), Roy's brother Melvin was wounded. A local newspaper records. " I had just finished bandaging a lads head and had gone back to my own place in the trench when a shell burst right over us and a shrapnel bullet went through the fleshy part of my left forearm just below the elbow and another grazed my leg." The same Toronto newspaper published several of Roy's letters describing the fighting at Ypres. In part: "
We spent five nerve-wracking days in the trenches, and they were the worst I had the misfortune to experience. I can't tell you much owing to the censor, and can't remember it all very well. One day we made a charge, and were rapid firing all afternoon, and when we quit we could hardly lift our arms." He continues, "One poor fellow in the trenches beside me went crazy and he had to be taken away." In a letter written on May 10, 1915 he had these very eloquent words, "Henceforth and for evermore I am a strong advocate of peace." Roy was later wounded in fighting at Festubert on the May 24, 1915. He was taken to No. 1 Canadian Field Ambulance with a severe G.S.W to the Left hand. He was evacuated to England on May 29, 1915 First staying at the 3rd West General Hospital at Cardiff, and then in and out of a variety of hospitals and convalescent homes until he returned for duty with the 12th Reserve Battalion at West Sandling on June 15, 1916. Promoted Corporal at West Sandling on October 1, 1916. Roy is shown as being "on command to No. 2 Officers Cadet Battn. At Pembrook College Cambridge," on May 3, 1917. 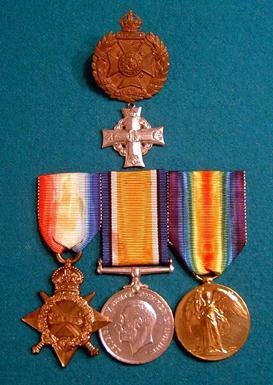 He was officially discharged from the CEF on August 28, 1917, on a commission to the 8th London Regt. Roy's service documents record that he was "To join the 8th London's on September 24, 1917 in the field." The 2/8th Bn. Of the London Regiment War Diary (WO 95/3006) records that their newest officer, Roy R. Poulton joined the 2nd/8th on 17 November 1917 in the field near Ypres. He presumably spent the time between the 24th of September and the 17th of November at an Infantry Base Depot in France and then at a Corps or Division reinforcement camp. The Regimental War Diary again makes mention of Pulton on May 1, 1918 at a 2/Lieut., this time showing him in command of A Coy of the 8th Londons (2/8 and 1/8 Londons had amalgamated in Feb 1918). On 1 June he is shown as a Captain, still OC A Coy. In order to be promoted Capt he would have had to have performed satisfactorily as a company commander for 28 days. Capt. 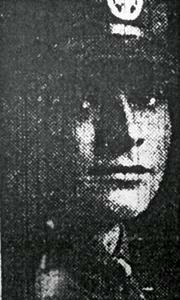 Roy Roswell Poulton was killed in action on August 8, 1918. The 8th Londons part at the Battle of Amiens on 8 August 1918, (and what Ludendorff called the Black Day for the German Army); saw them attached to the 58th Division, that attacked in the north of the sector, astride the Somme Canal. The Battalion had a good day, capturing all its objectives and ending up on the western edge of Malard Wood. They took 500 prisoners, including two battalion commanders. Unfortunately, fog held up the rest of the brigade and the key objective of the Chipilly Spur remained in German hands. On 9 August the 8th Londons helped in its capture and were withdrawn into rest two days later. By then they had suffered 300 casualties, including all their HQ officers. The circumstances of Capt. Roy Roswell Poulton death are described in a report by his Commanding Officer Lt Col Derviche-Jones. On 8 Aug A Coy reached a `quarry-like ravine' to the north of Malard Wood. The enemy here apparently put up a `stiff fight' and Poulton was killed in the process. Indeed, A Coy suffered heavy casualties and by the following morning had no officers left. A local Toronto newspaper records, "According to a cable received by his father Mr. Poulton, 51 Yonge Street his son Capt. R. Poulton has been killed in action on August 8, while serving with the 8th Londons an Imperial Regiment. Capt. Poulton was 25 years of age and was wounded at Festubert. He went overseas with the 1st Canadian Contingent as a Private. Before enlistment he was employed by the Gurney Foundry Company." Having no known grave he is commemorated on the Vis-En-Artois Memorial France. For a direct link to the author of this article, contact David Bluestein.